How Do We Find the Road of Yellow Bricks? This is the third chapter of a series about the author L Frank Baum and the wonderful fantasy world he created called Oz. Here we are going to continue to take a brief look at some of the books, and learn more interesting facts about Baum. If this is your first visit, you might want to pop over to Parts One and Two to catch up. The links are listed below. Don't worry. You won't get lost. I have sent a guide to lead you back here when you are ready. "What is the best way to get to the Emerald City?" asked Ojo. "I know; but what road shall I take?" was the boy's next question. "The road of yellow bricks, of course. It leads directly to the Emerald City." "And how shall we find the road of yellow bricks?" "Oz--Oz! more about Oz, Mr. Baum!" In our last chapter we learned that Ozma had decided to close the borders of Oz to all visitors and to make it invisible. This was an attempt by Frank Baum to end the Oz series, but as we will see, it was not to be. Due to financial problems, he had to restart the series which brought in the most money. This created a credibility problem, for as the Royal Historian of Oz (which Baum had begun to call himself) how was he to get news from Oz? He explains in the prologue to Patchwork Girl of Oz that a child suggested he contact Oz with wireless telegraphy. And so it happens that more Oz books were created, solely due to the invention of telegraphs. Artwork by John R. Neill is in the public domain. The Patchwork Girl of Oz introduces some new characters to the Oz landscape. There is, of course, the Patchwork Girl named Scraps. She was made out a quilt and brought to life with the Powder of Life, with the intent that she become the servant of the Crooked Magician’s wife. We also meet Ojo the Unlucky, a little Munchkin boy who must go on a quest to find all the ingredients for a spell. It seems that his uncle and the magician’s wife were accidentally turned to marble when the Patchwork Girl came to life. Once again, my favorite character is a cat. A glass cat, to be exact. It was brought to life by the same magical powder that was used on the Patchwork Girl. The cat turns out to have an attitude, much like Eureka in a previous book. It spends a lot of time admiring it’s pink brains, and expects everyone else to admire them too. The cat decides to join Ojo on his adventure because it was bored living with the Magician and his wife. Scraps decides she doesn’t want to be a servant, but wants to see the world. She, too, thinks she is very beautiful, although most everyone else say her patchwork colors are a bit too garish. The book describes the long journey taken by Oja and friends, as well as Dorothy and the Scarecrow. Along the way they meet the most interesting creatures (well, what did you expect? This is Oz!). Ojo the Unlucky finds out that it is his own perception of himself that makes him seem unlucky. With some advice from the Tin Woodman, he begins to see that he is lucky after all. “I hope your friends are not dignified,” observed Scraps. Image by John R. Neill and is in the public domain. The very marked success of my last year’s fairy book, ‘The Patchwork Girl of Oz,’ convinces me that my readers like the stories “best of all,” as one little girl wrote me. So here, my dears, is a new Oz story in which is introduced Ann Soforth, the Queen of Oogaboo, whom Tik-Tok assisted in conquering our old acquaintance, the Nome King. It also tells of Betsy Bobbin and how, after many adventures, she finally reached the marvelous Land of Oz. Image by John R Neill and is in the public domain. The foundation for the eighth book, Tik-Tok of Oz, was already written as a stage musical of the same name. 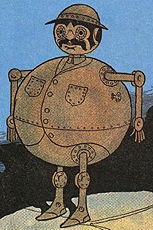 The character of Tik-Tok is a mechanical man first introduced in the book Ozma of Oz. Baum want to make a musical of that story, but was hindered by issues regarding the use of the characters of Ozma and Dorothy, who were already being used in other stage productions. In this book, we have the new character of Betsy Bobbin who takes the place of Dorothy. Betsy is also lost in a storm washed ashore, this time with a mule named Hank instead of a chicken. There are many similarities with previous books and some discrepancies as well. The most puzzling one for me was when the Shaggy Man, who is on a quest to rescue his brother from the Nome King, meets Polychrome, the Rainbow’s daughter. They both act as this was their first meeting, although they had many adventures together in a previous book, The Road to Oz. Despite this, the book has its own story line, most of which does not take place in Oz. Tik-Tok has an important role, and since the book carries his name, we will talk about him some more. He is run by clockwork made active by three keys, which when wound allow him to think, speak, and move. His clockwork often runs down, and he must be rewound by others. In this story, the rest of the adventurers find him in a well, where he was thrown by the Nome King. It is commonly believed that Baum was the first English language author to write about a robot. Of course, the word robot wasn’t used back then, so Tik-Tok is called a mechanical man. In an article entitled "Tik-Tok and the Three Laws of Robotics" authors Paul A. Abrahm and Stuart Kenter propose that Tik-Tok embodied the three laws of robotics before Isaac Asimov had invented them. “FIRST LAW: “A robot may not injure a human being, or, through inaction, allow a human being to come to harm.” Never does Tik-Tok in any way show hostility toward, hurt, or make a threatening gesture against a human being. “Do all the animals in Oz talk as we do? “Do you know why?” asked Ozma. “Why, he’s a Kansas dog; so I s’pose he’s different from these fairy animals,” replied Dorothy. “Goodness me!” exclaimed Dorothy. “I never s’pected Toto was fooling me all this time.” Then she drew a small silver whistle from her pocket and blew a shrill note upon it. A moment later there was a sound of scurrying foot-steps, and a shaggy black dog came running up the path. Toto looked up at her with his bright black eyes and wagged his tail. “Bow-wow!” he said, and Betsy knew at once that meant yes, as well as Dorothy and Ozma knew it, for there was no mistaking the tone of Toto’s voice. Toto’s tail was wagging furiously now, but otherwise he was silent. “Woof!” said Toto, and that meant no. He looked at her steadily a moment. “All right. Here I go!” he said, and darted away as swift as an arrow. Portrait of Indian chief Sitting Bull (1831-1890) is in the public domain. In Part 1 of this series, I mentioned that we would get back to Aberdeen, South Dakota. Now is the time. After the massacre at Wounded Knee he wrote another editorial. “The PIONEER has before declared that our only safety depends upon the total extirmination [sic] of the Indians. Having wronged them for centuries we had better, in order to protect our civilization, follow it up by one more wrong and wipe these untamed and untamable creatures from the face of the earth. In this lies safety for our settlers and the soldiers who are under incompetent commands. Otherwise, we may expect future years to be as full of trouble with the redskins as those have been in the past. To say that I am heartsick is an understatement. I almost stopped writing these this series. Still, something nudged me to keep going and the story needs to be told, the good, the bad, and the ugly. Could this be the same man who supported women’s rights? Who loved children? The same person that wrote stories about strong female characters, and about a land filled with unusual and bizarre creatures that are treated with respect and dignity? The clash of the two is almost unbelievable. Advocating genocide of any group of people is never acceptable. Years later some members of the Baum family apologized to the Sioux nation. Still, that does not erase the words that were put on paper. So how can I reconcile this in my heart? How can I throw out a treasured childhood memory and images that still live with me to this day? The truth is that I can’t. Oh, I could take the easy way out and say that he was just repeating the sentiment of most white people at that time. But it doesn’t make it anymore palatable. So, I chose to focus on the fact that we all have a dark side. Carl Jung called it the Shadow, It is part of our unconscious mind, the parts we repress and do not acknowledge. Everyone has a shadow side, and part of my spiritual path is to acknowledge this dark side, and to go into the cave and wrestle with it, much like Luke Skywalker did when he battled himself in the cave on Dagobah. The topic deserves a more thorough exploration. For now, let it suffice to say that Frank Baum, for all of his positive creativity, did indeed expose his Shadow side when he wrote those words. Whether he ever came to understand that part of himself, we probably will never know. Let it also be a lesson to those of us who are writers. When we write something and present it to the world, it becomes a part of history. We should choose our words carefully, so that our descendants will not have cause to apologize for those words. Tot and Capt Bill Artwork by John R Neill and is in the public domain. “The Army of Children which besieged the Postoffice, conquered the Postmen and delivered to me its imperious Commands, insisted that Trot and Cap’n Bill be admitted to the Land of Oz, where Trot could enjoy the society of Dorothy, Betsy Bobbin and Ozma, while the one- legged sailor-man might become a comrade of the Tin Woodman, the Shaggy Man, Tik-Tok and all the other quaint people who inhabit this wonderful fairyland. It was no easy task to obey this order and land Trot and Cap’n Bill safely in Oz, as you will discover by reading this book. Indeed, it required the best efforts of our dear old friend, the Scarecrow, to save them from a dreadful fate on the journey; but the story leaves them happily located in Ozma’s splendid palace and Dorothy has promised me that Button-Bright and the three girls are sure to encounter, in the near future, some marvelous adventures in the Land of Oz, which I hope to be permitted to relate to you in the next Oz Book. Trot and Cap'n Bill siucked into the were pool. Artwork bu John R. Neill. This book probably should have been entitled Trot and Cap’n Bill in Oz. The Scarecrow doesn’t make an appearance until Chapter 13. 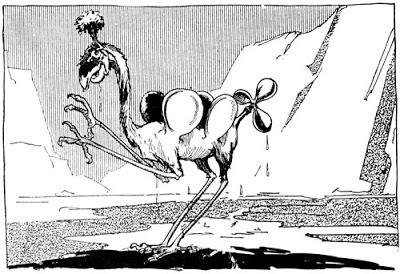 Trot and Capt Bill were characters in a couple of Baum’s non-Oz books, such as The Sea Fairies and Sky Island. These books did not sell as well as the Oz books, and whether or not his readers clambered for Trot and Cap’n Bill to travel to Oz, he introduces them in this book to the other characters of Oz. I remember well the scene where Trot and Cap’n Bill are sucked into a whirlpool at sea. They are pulled into a cavern under the sea, from which they must escape or starve to death. As you can see, there are many ways to get to Oz. Baum was a frequent visitor to the San Diego area where he liked to stay at the Hotel Coronado. He also was very attracted to the La Jolla area which contains several sea caves. One of them is the Sunny Jim’s Cave, which became accessible from the land from a tunnel built in 1902-3. I have visited this cave myself and found it quite fascinating. I didn’t realize until later that Baum visited this cave during his trips to the area. Reportedly, he gave it the name Sunny Jim because the opening resembled a cartoon mascot for a brand of cereal named Force. One never really knows how much truth there is to these stories or whether it has become an urban legend that has been repeated over and over again. Here is a picture of the mascot on the Force cereal box I guess there is some resemblance, but we all know Frank Baum had a vivid imagination! Oddly enough, the artist of this Sunny Jim character was W. W. Denslow, the illustrator of Frank Baum's first Oz book. Let’s take a little intermission and do some exploring of this fascinating cave. La Jolla, clearly recognizable in L. Frank Baum's The Sea Fairies, Sky Island, and The Scarecrow of Oz, is described as an idyllic place with features of his fairylands, dissimilar to the settings from which children enter Oz in the rest of the Oz series. Yes, we will get to the Scarecrow. After all, the book is named after him. But first we must talk about an important part of the Oz stories. I am referring to Glinda's Great Book of Records. I will refer to it later as well, for it plays an important role in my own story. "Glinda is the Royal Sorceress of Oz. She has won­derful. magical powers and uses them only to benefit the subjects of Ozma's kingdom. Even the famous Wizard of Oz pays tribute to her, for Glinda taught him all the real magic he knows, and she is his superior in all sorts of sorcery. Everyone loves Glinda, from the dainty and exquisite Ruler, Ozma, down to the humblest inhabitant of Oz, for she is always kindly and helpful and willing to listen to their troubles, however busy she may be. No one knows her age, but all can see how beautiful and stately she is. Her hair is like red gold and finer than the finest silken strands. Her eyes are blue as the sky and always frank and smiling. Her cheeks are the envy of peach-blows and her mouth is entic­ing as a rosebud. Glinda is tall and wears splendid gowns that trail behind her as she walks. She wears no jewels, for her beauty would shame them. Among the many wonderful things in Glinda's palace is the Great Book of Records. In this book is inscribed everything that takes place in all the world, just the instant it happens; so that by referring to its pages Glinda knows what is taking place far and near, in every country that exists. In this way she learns when and where she can help any in dis­tress or danger, and although her duties are confined to assisting those who inhabit the Land of Oz, she is always interested in what takes place in the unpro­tected outside world." It so happened that the Scarecrow was making a tour of Oz and decided stop by to visit his friend, Glinda. While they were chatting, he asked Glinda if there was any news. She looked at her Great Book and was surprised to learn that there were three strangers in Jinxland. The Scarecrow begins his quest with enthusiasm, but it doesn’t take long for him to have some mishaps as well. Before the kingdom of Jinxland is put in back into balance, and travelers are safely escorted back to Oz, the Scarecrow has all of his straw pulled out of him by the wicked witch, is almost burned at the stake by the wicked King, and falls into a river and his straw gets so wet it must be discarded. Fortunately, he is saved each time by the very people he went to help. Eventually, everyone makes it safely back to Glinda’s palace where Dorothy and Betsy are waiting to greet them. One has to wonder, after all the excitement was over, who rescued whom? Perhaps the answer lies the words of the Ork, a strange type of bird who shared Trot and Cap’n Bill’s adventures. “Friends must stand together, you know, or they wouldn’t be friends. You can read all of these books for free. They are available as ﻿free e-books at Amazon,com﻿ and there are several places where you can read them on-line or download them to your computer. I still recommend getting a hard copy of the book with illustrations if you plan to be reading it to a child. The pictures are a big part of the story. On this site you will find the full and unabridged texts of classic works of English literature. I used this site a lot while researching for these articles as it is very easy to read. L Frank Baum's Oz books, sorted alphabetically. This concludes the third installment of our review of L Frank Baum and the fantasy land he called Oz. As you can see, there was much more to the story than just the musical “The Wizard of Oz.” We have followed Baum’s life while he wrote the books and even discovered his darker side. What comes next? Well, we have a few more books to review, including my favorite. (I know, I have a lot of favorites). In the next chapter, we will finish discussing the final books Frank Baum wrote while he was suffering from ill health. The last book, “Glinda of Oz” was published after his death. I also discuss my personal story that relates to the Wizard of Oz books.